Benefits of having a healthy diet with dehydrated foods is a well-known fact so being able to prepare your own for the whole family requires a high-quality dehydrator. For those of you who require larger volumes of foods processing, we suggest checking out Excalibur models. Its sheer volume capacity ensures that you get as much food ready and set for storage in the least amount of time possible! We also suggest that you check out some of our guides that will make it easier for you to understand how food dehydration works and why it’s good for you and your loved ones. Each of our review models offers something unique that makes it stand out. We shall now explain in more detail why Excalibur 3926TB Food Dehydrator makes a lot of sense and represents a great choice for bigger families. These main features make this a welcome addition to any home looking to eat healthily and store food for longer periods of time! Having an amazing 15 square feet of drying space, over 9 separate trays ensures you get a lot done in less time. The generous space allows drying any type of meats, fruit, vegetables or herbs all at the same time with ease. The adjustable temperature makes Excalibur 3926TB universally usable dehydrator that will allow you to process foods just the way you need. Making more space on the inside is as easy as removing trays to free up internal capacity. Patented airflow tech ensures that the dehydration itself occurs in a controlled manner to allow perfect results and long-lasting foods for storage. It’s important to note that this is a model that doesn’t use the rotation of inner trays and instead relies on the direction of airflow for best results. All heating elements and the fan are on the back which allows the cold air to flow over the whole surface area of the trays. During our time testing the review unit, it was performing great and it was reliable each and every time. Being the larger model certainly is a perk when you want to dehydrate large quantities of foods. It also means that you will need to find a suitable space in your home where it won’t get in your way. Measuring 12 ½” in height, 17” inches in width and 19” inches deep you may want to plan ahead before making the purchase. If you have big cabinets you will have no trouble fitting the unit even in smaller size kitchens. Performance wise, well, needless to say, that the Excalibur series of dehydrators are well known among both home and professional users and with a good reason too! Proprietary “Parallex Horizontal Airflow” patent ensures that all of the food dehydration returns perfect results each and every time. The 7-inch fan that is coupled with 600 Watt heating elements performs great and processes the whole inner volume fast and efficiently. The noise from the fan is not that bothersome which is a big plus in quiet kitchens and homes where noise levels are of some concern. The drying temperature is fully adjustable via the onboard thermostat and can be set at 105°F and all the way up to 165°F. This temperature range is optimal for various types of foods and ensures best results. Just be sure to read guides and the included manual for best results during use and operation of the unit. Besides the obvious larger than usual dimension that may not fit your kitchen space, there are some of the disadvantages of owning the larger 9 tray Excalibur dehydrator. We were facing the increase in vibration each and every time the fan was in use for longer periods during dehydration. Unfortunately, we aren’t the only ones noticing this issue which means that it is some sort of a manufacturing issue. The newer model revisions do not seem to suffer the same problems as we were informed by the manufacturer. It also worth mentioning that the unit needs significantly more time to dehydrate foods when you use all of the trays and fill them to their maximum capacity. Truth be told this is somewhat expected and not all that unusual. The customer support service could be a bit better considering the price of the unit and the reputation of the company. The agents are helpful and nice to talk to, however, the waiting times to get in touch are too long and demand plenty of patience. 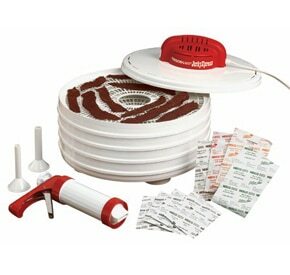 We are happy to say at the end of our in-detail review, that you won’t go wrong by getting your very own Excalibur 3926TB Food Dehydrator. Anyone doing lots of food processing and drying will benefit from its features and overall versatility. We will share a pro-tip about something that was useful during our testing period – be sure to take out one or two trays to allow more spacing for air to flow faster. This will speed up the dehydration while sacrificing a small amount of foods that will wait for the next turn. We feel that such a trade-off is well worth it! Value for money factor is very high with this model which means that you get a great kitchen appliance that will last you a very long time no matter how often you intend to use it. 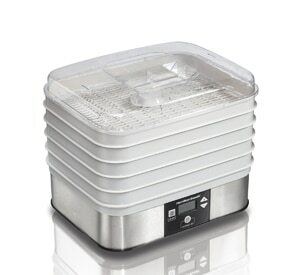 If this larger version is not suitable for your requirements – be sure to check out the 5-tray model instead or take a look at some of our other reviews of the most popular dehydrators. Our guides and relevant articles will help you decide and pick the best model to suit your needs!